August Bank Holiday weekend saw the Crich Tramway 1940s event return to the National Tramway Museum. These events always offer great fine art photography opportunities, and I returned again carrying my trusty Mamiya C330F to the event. I chose to use both the 135mm and 80mm lenses on the Mamiya C330F, as both of these great lenses produce fantastic results. I’ve wanted to use the longer lens more often for portraits, as it can really make the subject pop out of the frame with excellent contrast and very sharp detail. ‘We will remember them’ is a sentiment often linked to memorial events and remembrance services. 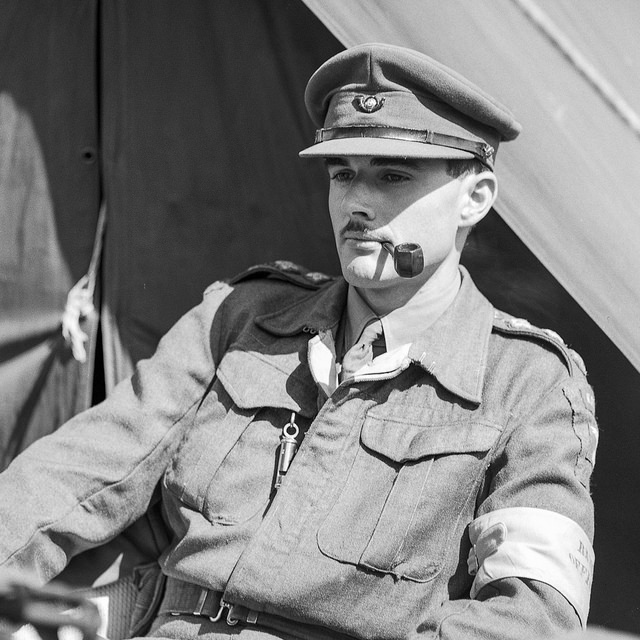 I managed to photograph an image that captured this, as a soldier smoking a pipe looked deep in thought on one of the displays at the Crich 1940s event. An officer possibly thinking about the comrades who wouldn’t be coming back. Finding narratives to images can often create more interesting photographs for viewers. One of the most troubling things about war is the young age of the soldiers who went out to fight, with many being in their late teens or early twenties when they went off to war. For many, this was a very traumatic experience as the tough conditions of war took their mental and physical toll on many people. 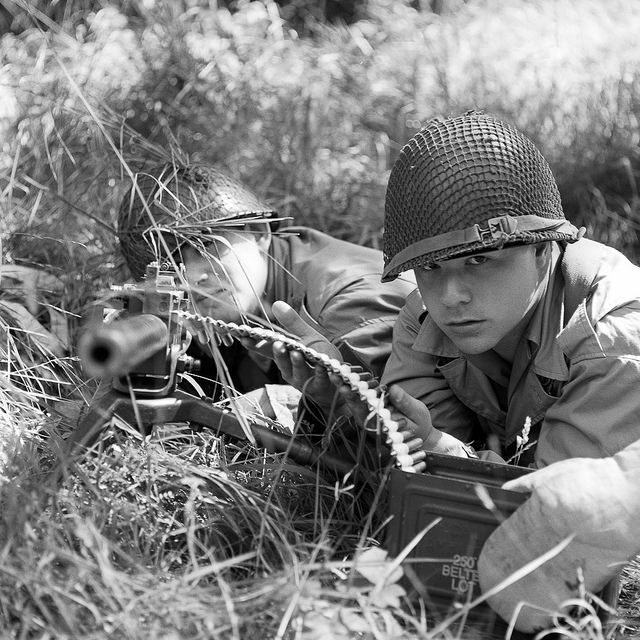 A couple of young soldiers get ready to fire an MG. The look in the right soldier’s eyes pierce the image, and the depth of field picks this out brilliantly too. Here I used a shallow depth of field to capture the expression on the young man’s face on the right, as he looks directly down the lens. I thought this image created a threatening yet contemplative photograph, as two people prepare to fire a devastatingly powerful weapon. One of the hardest aspects of photographing at these events is managing to cut out distractions in the background, as other visitors and people walk around. This can work in my favour at times, as people dressed in suitable clothing in the background can actually add to the image. There are times though, that complete removal of background distractions can produce a really strong, focused image. The lighting on here casts half of the soldiers face in shadow, creating extra depth to the image. A swirly bokeh effect produced by the Mamiya lens creates a slightly surreal looking background. This photograph showed how well this act of simplification works, with the only two elements of the image being the soldier and the background. The swirly bokeh effect created by the lens of the Mamiya produced an interesting background. The strong shadows across the face and body of the subject gave the image some real depth, and produced a great piece of fine art photography. For those left behind at home the war was still a part of every day life, and people from every kind of background was required to do their bit for the greater good by joining up to volunteer groups. The Land Army was one such organisation, where many women helped to farm crops to feed troops on the battle field and a country being blockaded by German U-Boats. 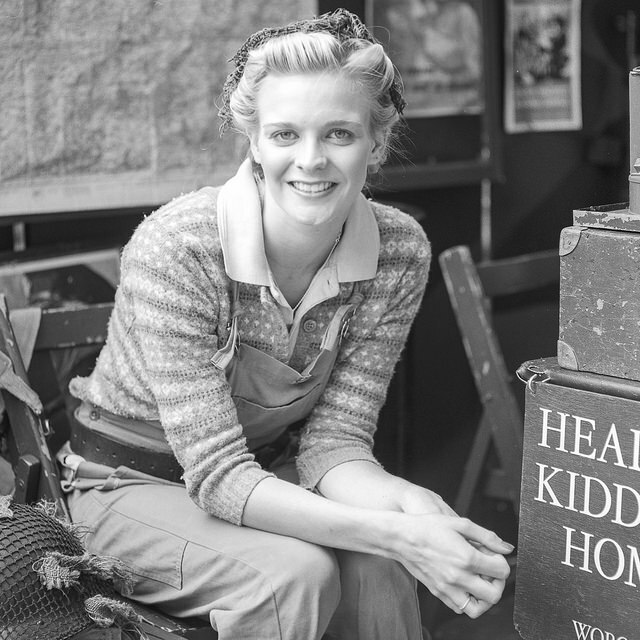 A lady dressed as a land army worker puts on a brave face. 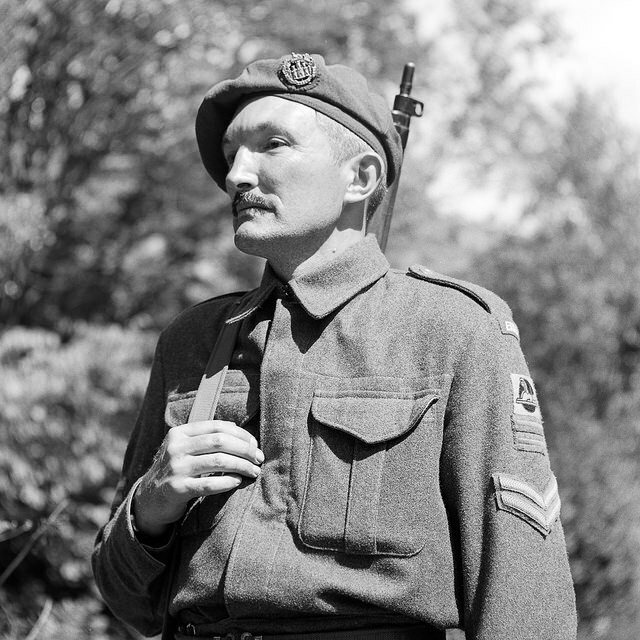 The combination of the uniform and the army paraphernalia suggested the close link between the soldiers on the front and those left back home to do their bit. To me this image showed the spirit of those who had to work hard to support troops on the front line, while making the best of a bad situation. Without the help of the Land Army, the war simply could not have been won. As usual the re-enactors at Crich proved to be great subject to photograph, and the lovely weather certainly helped. I have found that using depth of field, simple composition and a great pair of lenses could produce many great fine art photographs. A full set of my photographs can be seen in my Crich Tramway 1940s event album on Flickr.